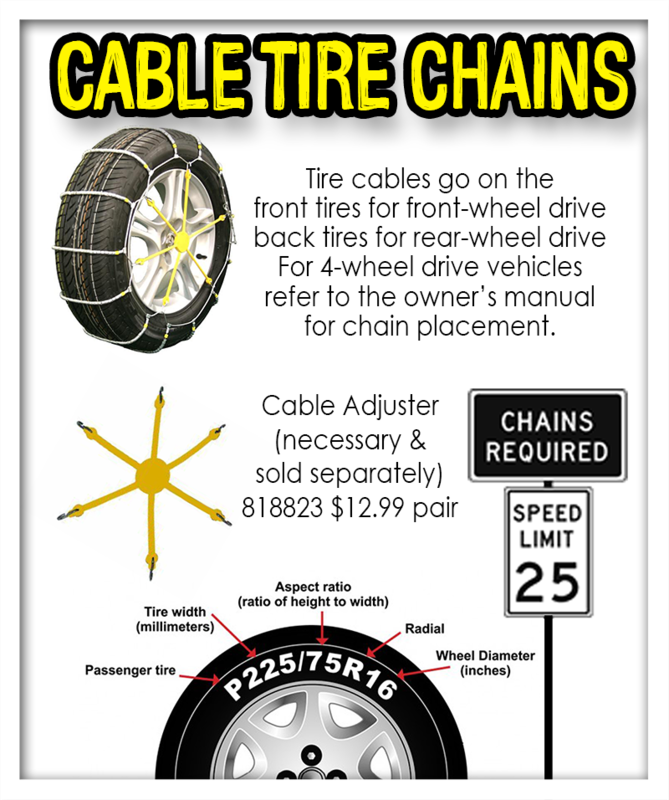 Veteran Tahoe travelers know that tire chains, also known as tire cables, are sometimes necessary when by the pair and help car or truck tires get more traction in conditions where snow and/or ice have accumulated on the road. Four-wheel-drive and all-wheel-drive vehicles with snow tires used to be exempt from chain controls, but no longer. All vehicles must now carry chains to enter a chain-control area. Our Cobra™ cable chains feature tough carbon-steel rollers that provide traction and long wear. The low-profile steel rollers allow increased tire-to-road contact, resulting in better stability, plus a considerable reduction in noise and vibration, and they are galvanized for rust prevention. All Cole Hardware locations stock four of the most popular size cables for cars (Skus 818818–21, $46.99–$49.99) and a popular truck size (Sku 818822, $99.99). Just bring in your specific tire size as set forth by the ISO metric tire code. Virtually all tires have this information molded into the sidewalls, or you can refer to the factory specs for tires if the tires have not been changed on your car since you purchased it. What if we don’t carry your size? No worries! We can special order the chains for you. Just come in with your tire size by Monday, and if we don’t have the size you need, we’ll order them and have them in our store for you by Thursday of that week. IMPORTANT! If you buy a pair of Cobra cable chains, you must use a pair of tensioners with them. These are essentially six small, rubber, bungee-type cords bound by a circular rubber piece in the center, and come two to a bag. (Sku 818823, $12.99) This is an integral part of the Cobra system and cannot be omitted.